Following on from Dr. Pete Meyer’s epic post on life beyond rankings I have decided to take it one step further and illustrate exactly why rankings aren’t the be all and end all of a modern online marketing campaign, and which metrics need to be the bread and butter of any successful strategy today. Now, I’m not saying search engine rankings are dead, far from it, but as a sole reported metric, it’s difficult to understand the value and return on investment that they deliver. 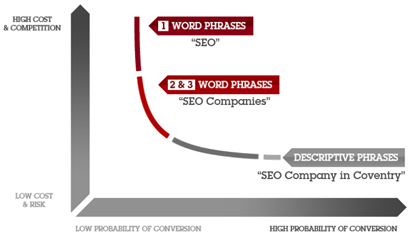 Ever since businesses recognised the value of search engine optimisation, and the need to have their website well positioned within Google’s index for key search terms, monitoring straight up keyword rankings was a relatively easy way to define and analyse the effectiveness of an SEO campaign, along with measuring the efforts of an SEO Consultant. After all, consistent ranking improvements must mean somebody, somewhere must be doing something, right? However, ranking fluctuations way back when, were a lot less frequent compared with those of today. We are now seeing algorithmic changes on an almost daily basis, along with the massive improvement in the ability to track hundreds of different key stats and figures. Combined, these show one of the most important figures of all, the return on investment (ROI)! 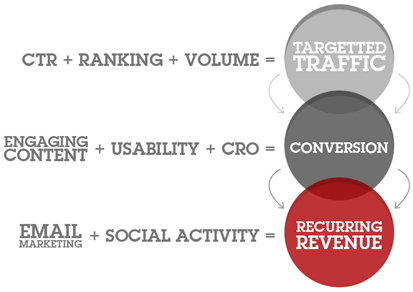 With the ever emerging effectiveness of inbound content marketing, social media, long-tail key phrase targeting, A/B testing and conversion rate optimisation the methods, strategy and metrics available to report on are vast. As good practice SEO shifts further and further into marketing defined roles it’s becoming increasingly more important to understand the importance of each metric within your campaign, without getting hung up on plain simple rankings. 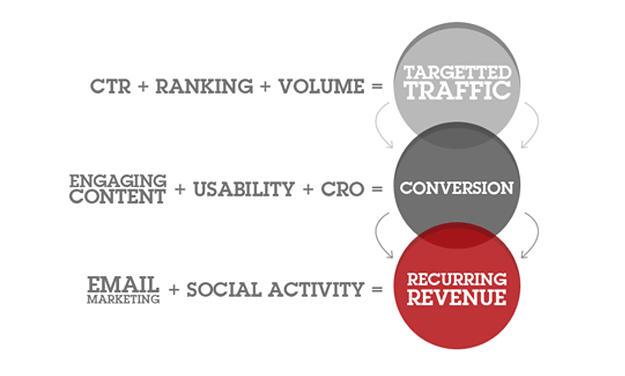 Using the below formula we can identify the three key reporting areas of an online marketing campaign and the elements that make up the success of each key element. The idea behind this is to illustrate the overall structure of a well oiled campaign and the in-depth reporting this achieves, rather than simply having the blinkered approach that rankings are the only metric that matter. To prove the effectiveness of this model let’s remove “volume” from the equation. Now we’re looking at a whole different ball game, the process breaks down when we remove one key element from the starting equation. Although we still have our search engine rankings, amazing page titles and descriptions that have the potential to invoke high click-through rates, without the ability to yield search volume no one is going to come through to your website meaning no future conversions or recurring revenue. The effectiveness of this process also allows for campaigns to exploit upon the un-tapped riches with long-tail key phrase targeting and generating content specific to answering the questions your potential customers currently have (the inbound marketing approach). The below graph illustrates the effectiveness of using these methods along with harnessing the strength of your website to increase search engine visibility and brand awareness leading to greater converting traffic volumes. Taking some time out to properly research your market and understand the key phrases / questions your potential customers are asking means you can quickly capitalise on search terms that hold little or no competition and begin to attract further convertible visitors through to your website. Keyword tools such as UberSuggest and Google Discussions can allow you to easily find the profitable long-tail phrases and unanswered questions within your market. Finally, I’d like to reiterate the point that rankings are not dead, but as a sole metric to report on I firmly believe there is a bigger picture that most are overlooking. This is due to the sheer blinkered vision most have towards the success of an online marketing campaign. As Google looks to clean up its index and provide the best possible results to its users there is a massive opportunity to create engaging content and rich media that attracts the right people to your website! I would love to hear what other industry professionals think of this approach so please leave us a comment or send us a tweet!